There are different souvenirs in one’s life, some are linked to childhood, others to love, passion, and travels. For my active imagination, food memories act as an introduction to each chapter in my life. They are the backdrop to my world, flavouring it with taste, colour and texture. If you are what you eat, then I am certainly a mix between French, Chinese and British food. My love for a confit de canard with a glass of red St-Estèphe, xiao long bao (Shanghainese steamed pork dumplings) with pu-erh tea, a good pork pie, scotch eggs and a half a pint of Guinness (I’m a lightweight) are equal and unconditional. As I grew up in Hong Kong during the colonial days, I was heavily influenced by British food and culture. I cherish those years, filled with iconic images of queen Elizabeth’s portraits at the post office, the old police uniforms, the Gurkha army playing the Scottish pipes on the Queen’s pier and the occasional visit of the Prince of Wales. We had tea at the Mandarin Hotel, scones with clotted cream and rose petal jam, or at the old Repulse Bay hotel (not the one they re-built), just like in Ang Lee’s Lust and Caution. I loved the mixture of old-school British traditions mixed with Chinese flair – it was the story of my life. Some of my favourite moments where spent at the Shanghainese tailors, waiting for hours for my French maman, having her traditional chong sam dresses made for future banquets. I’d browse through the beautiful silk embroidered fabrics, snack on egg tarts and sip soya milk out of a bottle. It can be strange at times to feel part of a vanished era, but it’s all there, vivid in my mind, set in a vintage filter. Not that Hong Kong is that different today, but it will certainly never be the same. Conversations at home were dominated by food, as my family is certainly a food-obssessed one. My life was and is meals. Later on I lived in London, studying and enjoying life as a Londoner. My fondness for British food grew bigger and bigger, as I discovered more delicacies throughout the years. Steak and kidney pies, Cornish pasties, minced pies, toast and marmite, Cadbury Flake chocolate, treacle pudding, just don’t get me started. Last Saturday, I just had to have roast beef, juicy gravy and Yorkshire pudding. It’s the inner ‘Brit-girl’ in me. That and a bread and butter pudding to finish it off. Could a Saturday lunch get any better? Slice cabbage coarsely, slice shallots and finely slice the radishes. Set aside. Prepare a quick vinaigrette: Mix mustard, olive oil, vinegar, salt and pepper and mix well. Fry the shallots in olive oil until golden and nearly crispy, drain on paper towel and set aside. 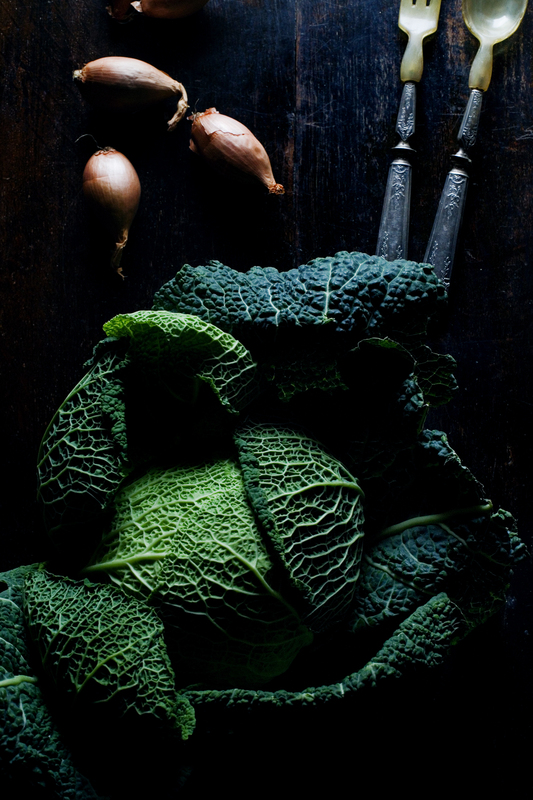 In the same pan, keep the oil and fry the cabbage for a 3 minutes on a high heat – you want to keep it crunchy. To assemble: Mix cabbage and radishes. Place on a plate, sprinkle shallots, drizzle vinaigrette, add a spoon of crème fraîche, sprinkle a generous amount of parsley. Season with salt and pepper. Rub beef with olive oil, salt and pepper. Make about 10 small incisions with a sharp knife and insert fine slices of garlic. 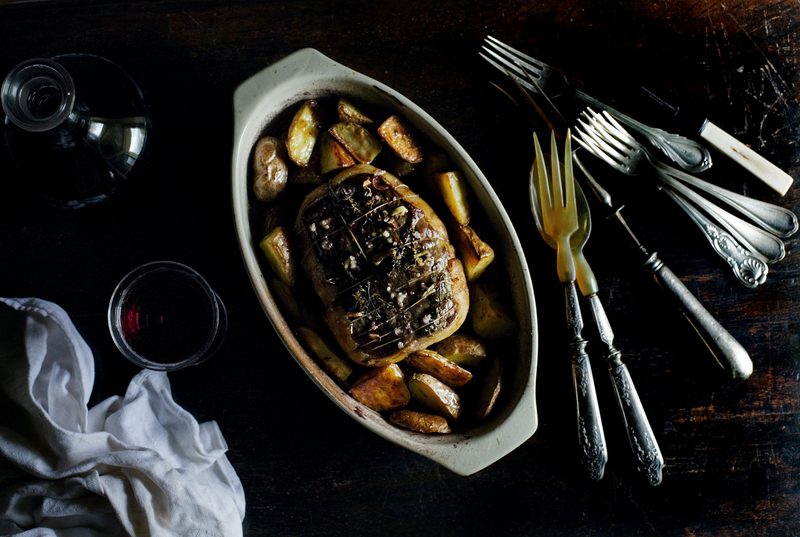 Tuck in the thyme sprig son top of the beef – under the string. Place onion, carrots and celery in a roasting pan along with the beef. Place in oven and bake for 15 minutes, lower heat to 180°C/ 350°C and cook for a further 30 minutes (less or more depending on how you like your cuisson/cooking). For me, 45 minutes in total is perfect, brown outside, rosé inside. Place the roast beef on a plate and set aside for 15 minutes. Keep the roasting pan with all the beef drippings (you can save some for the Yorkshire pudding). Put it directly on the stove on a low heat, add 200 ml red wine and stir. Let the sauce reduce for a few minutes, then add 500 ml beef (or vegetable) stock. Further reduce for 5 more minutes. Add one tsp of flour and mix well until gravy is thick and juicy. Drain sauce and serve immediately. In a small bowl, soak raisins in rum. Butter slices of bread very generously on each side. Drain raisins and reserve rum. Place a layer of bread, sprinkle with raisins, add another layer, sprinkle with raisins again. Pour the remaining rum all over the bread. In a bowl, mix milk, cream and eggs, add granulated sugar, salt and nutmeg. Pour all over bread, and leave to soak for 10 minutes. Add the remaining butter all over the top. Sprinkle with dark muscovado sugar. Place in oven and bake for 30 minutes. Serve hot, with lots of cream poured on top. Everything looks delicious! Question for you – what are the little pastries/donuts in the first picture? So cute! Not a day goes by that I do not give thanks for the upbringing I had, raised by a smart woman and man who educated me to embrace home cooked meals. I learned how important sharing meals can be as a child, a woman, a mother, a wife. I hope to pass this on to my very own children. Yes, I agree. I think it is extremely important that children also receive a food education. Every bit of this sounds amazing! Your story is so interesting, and I love how you embrace the mix of cultures so beautifully. The meal looks so warm and comforting. Totally agree. Yum…! British cuisine can be so wonderful! Unfortunately, it is so often totally underestimated as well, by those not-in-the-know. Thanks for sharing your beautiful story and these lovely pictures. 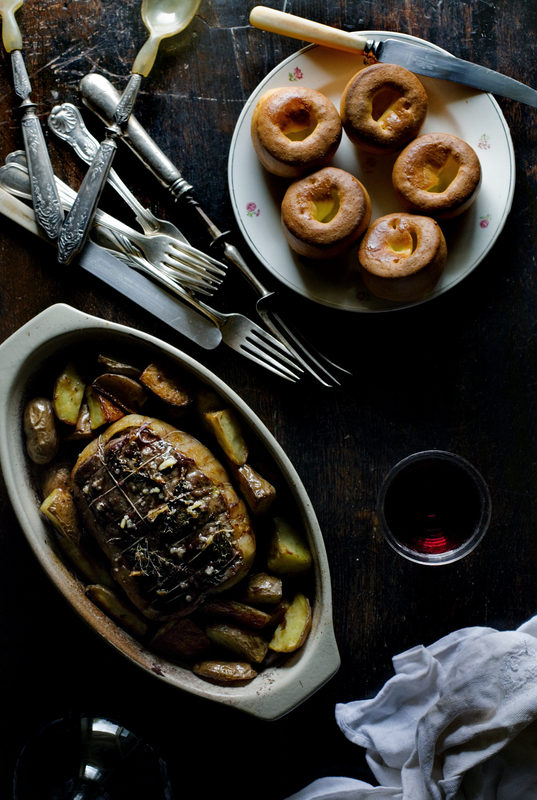 My family is English and I grew up on roast beef and Yorkshire pud every Sunday. But ours is made in a large pan,not individual puds! 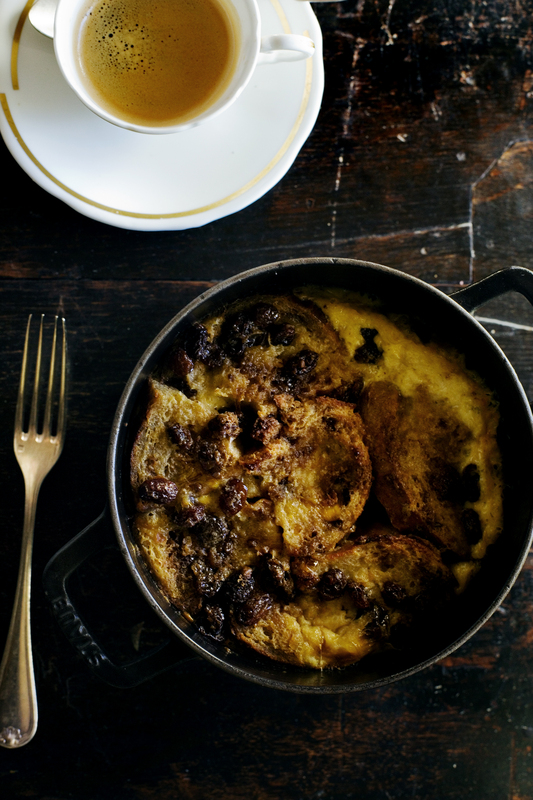 Nor would we serve bread pudding for dessert after if we had Yorkshire puds and gravy. More likely an apple crisp or crumble, or some lighter fare. I still cook English food, and as many have pointed out here: it is vastly underrated. Oh yes. I know what you mean. This remark was not a criticism, only a comment as to how we really eat. But it would like your family eating the same dish with noodles and then serving a noodle dessert! I just made bread pudding (which I eat in wintertime) not long ago. But I had a much lighter dinner beforehand. It is like the difference between High tea and Afternoon tea, which a lot of Americans do not seem to understand: High tea is supper; not the little delicate finger sandwiches and cakes one things of at Afternoon tea. 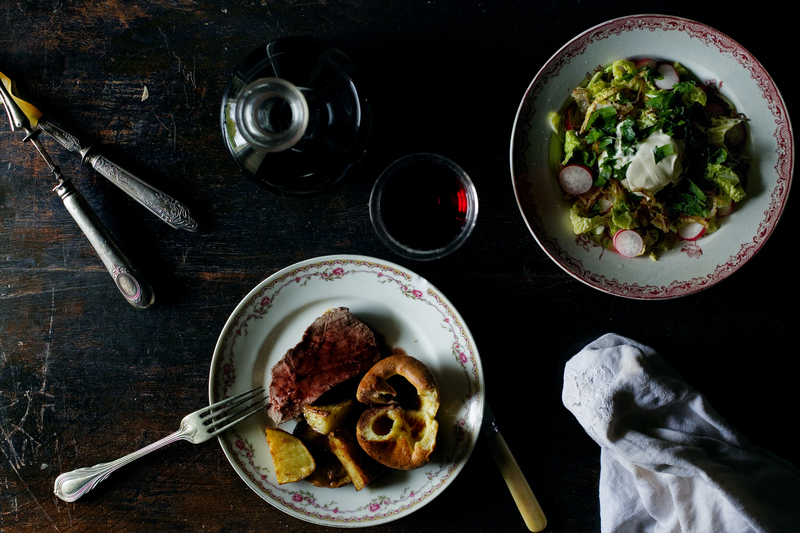 Roast beef and Yorkshire Pud is the standard traditional English Sunday lunch or dinner. One thinks of stereotypes in English food, but we do have food rules (like the French), too! I love hearing your stories of growing up and i also love this menu! I’m always looking for an alternative to turkey for our thanksgiving meal and this menu looks perfect! 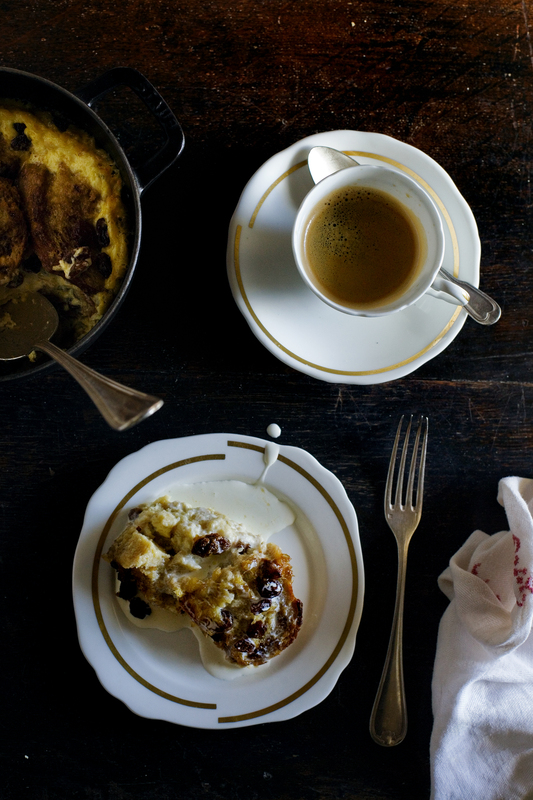 Bread pudding is simply the best. I love this story!! ”My life is means” sounds so inspirational to me! I have days, especially while being in France that I can hardly wait for my return from the market to start my cooking adventures. ‘filled with iconic images of queen Elizabeth’s portraits at the post office”. This sentence says so much to me..
Anyways, living in a predominantly Chinese area of Toronto, I got the opportunity to enjoy the Chinese-British food flavors on a day-to-day basis. Yes, we do hear much less about British food these days, and I find it relevating to get my thinking back to some ‘very British’ culinary highlights. I’m right now discovering the watercress as a healthy ingredient and am trying out a number of watercress salad recipes from British sources in the net. I just love your blog! Yet again, a lovely post. I haven’t been to any of those places but I’d love to go some day. Thank you for the recipes! When I was a young girl I read “The House of a Thousand Lanterns” – about a young English woman who moves to Hong Kong in the late 19th century. I became fascinated with the history, culture, and sophistication of Hong Kong. What a fantastic childhood you must have had growing up there! Being part of a by-gone era is certainly something to cherish. I’d love to hear more of your memories from that time! You are so beautiful. I think you have the most beautiful life style in the world. Hi Mimi. So glad I discovered your blog. That meal looks absolutely delicious, real comfort food. Like you, my cultural influences are Chinese, French and British – such a great combination! I guess if you are in France, then you would want to make the most of the wonderful local produce, but I would love to see some Chinese recipes, if you have any. I’s a bit sad that here it’s just another work day (with back to back meetings). Would love to hear what you cooked. I like your blog and LOVE the photographs.